Earlier in December we were lucky enough to spend a lovely, sunny week in Gran Canaria. This post is about a couple of the products we enjoyed discovering on this trip. As mentioned in the previous post, we were lucky that our resort and town was full of Scandinavians. 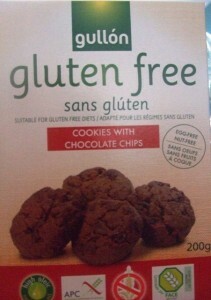 This was to our advantage as it seems that a large amount of them have issues with gluten. As Oatly is made in Sweden it is perhaps also why we were lucky enough to find a supply for MIB in the local mini-market. I was surprised, but it was great to not have to ration the one carton we took to last all week. 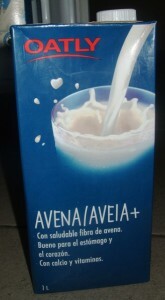 There was also a huge range of soya milk too (for me). The two local mini-supermarkets also sold a good supply of Free From foods. Sadly I didn’t find any decent gluten free bread for me, but I had a good supply of rice cakes to choose from. We even managed to find a dairy free margarine by day three. These biscuits were by far our favourite. MIB and I sneaked them away from Daddy (no food problems) as we were so happy to find something so scrummy that we could both enjoy. The chocolate ones did disintegrate quite easily, but they were well worth it. 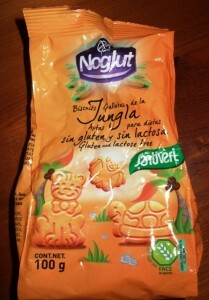 The Jungla ones are plain but just what was required when we needed a snack that wasn’t too sweet and who doesn’t like animal shaped biscuits? We still have half a pack left here but it won’t last long as these are also delicious. Last year we used Sun Sense sunscreen on prescription. 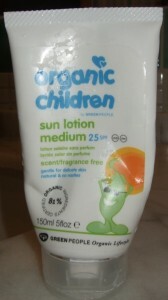 This year, on some advice and much internet research I decided to try the Green People sunscreen. It gave MIB good protection, was really thick to put on, did not wash off easily in the sea or pool and didn’t seem to give him a reaction. Well, not an eczema reaction but you should have seen the fuss putting it on! Why? Well, it is ‘scent/fragrance free’. However, this is inaccurate wording as it does smell. And it’s not too pleasant either. I understand that we don’t want synthetic fragrances in there, but perhaps the wording should be ‘no fragrance added’ or something. After one day MIB flatly refused to have it near his face and was quite upset after a few days to have it on his chest and upper arms. This was not what I was expecting at all. The only way we could placate him was to use the face sunscreen I’d brought along for me and Husband. It was a recommendation from Sugarpuffish and was great for me as I usually break out in spots with normal sunscreen on my face. Although I was reluctant to use it on MIB’s delicate skin, it seemed to moisturise well and give him protection from the sun. The bonus is that it smells deliciously of lemons so we could occupy his nose with that whilst quickly applying the other one. All in all, the holiday was good and there were no problems sourcing food and no major skin reactions. We were lucky with the resort but it has also given me more confidence in travelling with MyItchyBoy. MyItchyBoy is allergic to peanuts, dairy, eggs, soya and white fish. Peanuts is the bad one, the others give him bad eczema and other mild reactions. I have gluten sensitivity and lactose intolerance. So, we are usually an awkward pair to travel with.